How To Apologize For Sexual Harassment (Hint: It Takes More Than 'Sorry') Psychologist Harriet Lerner says apologies shouldn't ask for forgiveness, and they don't even have to say sorry. It's more important to give an "an emotionally packed corroboration" of what happened. 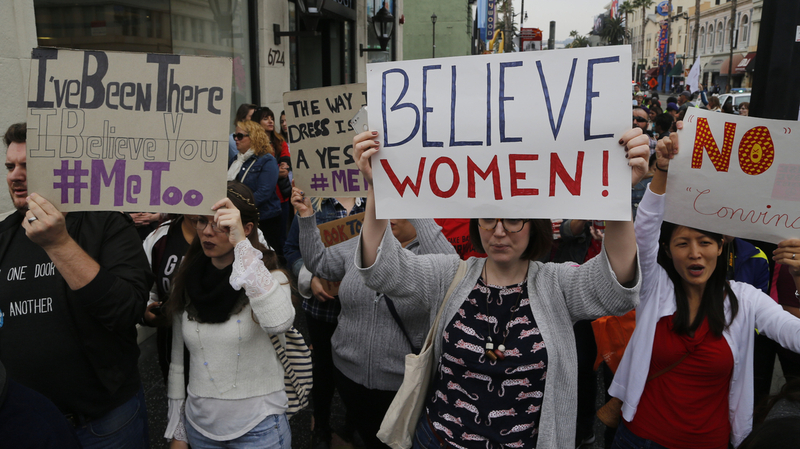 Demonstrators walk in the #MeToo March against sexual assault and harassment in Hollywood on Nov. 12. Nearly every day brings another apology from yet another high-profile man accused of serial sexual harassment. It was an act of unbelievable prescience for psychologist Harriet Lerner to dedicate her latest book to the art of apologizing. Prescience, of course, because nearly every day brings another apology from yet another high-profile man accused of serial sexual harassment. 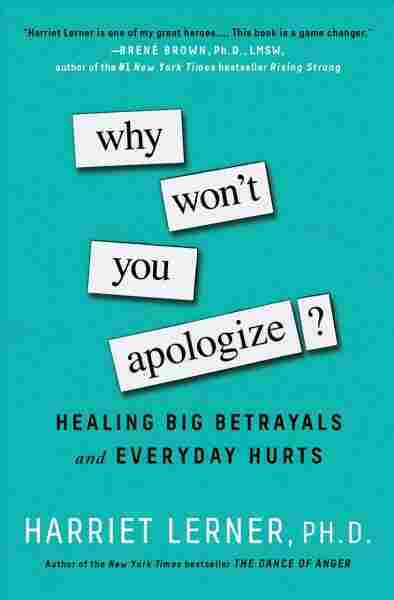 Lerner says the reason her new book is titled Why Won't You Apologize? : Healing Big Betrayals and Everyday Hurts is because human beings find apologizing deeply difficult. "Humans are wired for defensiveness," she says. "And it's very hard for us to take clear and direct responsibility for specific things we have said or done — or not said or done --without a hint of blaming, obfuscation, excuse-making [or] bringing up the other person's crime sheet." When it comes to apologizing publicly for sexual harassment, well, that's morphed into something of an apologia subgenre — one substantially different from apologies made privately. "Basically, it's a performance," Lerner points out. "It's an act of self-protection, an attempt to do damage control, to save one's reputation." Still, any good apology should make clear that the wrongdoer will carry some of the pain. Lerner offers an ideal example: "I will be struggling — perhaps forever — because of the harm I've caused women who trusted me to mentor and help them. What I have done will not slip out of my brain after the media attention has dimmed. I also understand that a reparation or restitution is due, and one that fits the emotional pain I have caused. " She adds a semi-serious coda: "For a start, I plan to give $50 million to organizations and institutions that are fighting to end harassment, abuse and violence against women." Another important thing to remember while issuing an apology — any apology, Lerner adds — is not to ask for forgiveness. Leon Wieseltier, a longtime literary editor at The New Republic, made that mistake in a recent statement after several female staffers accused him of unwanted kissing and otherwise harassing them. "For my offenses against some of my colleagues in the past I offer a shaken apology and ask for their forgiveness," Wieseltier said. Lerner emphasizes that nothing should be asked of the harmed party in an apology; just because they've apologized doesn't mean they've earned forgiveness. She also cautions against the rhetorical dodge Dustin Hoffman employed when responding to a woman who claimed he'd harassed her when she was a teenager. "I have the utmost respect for women and feel terrible that anything I might have done could have put her in an uncomfortable situation," he wrote. "Might" is the operative word, Lerner says. Much like "if" and "but," this qualifier cancels out sincerity. Saying something like, "I'm so sorry if you felt hurt by what I did," is almost worse than not apologizing at all. John Lasseter, the chief creative officer of Walt Disney and Pixar Animation Studios, recently issued an apology that referenced "unwanted hugs" and other gestures. But he weakened that apology by saying, "I deeply apologize if I have left you down." "These obfuscating, gaslighting apologies really are good lessons about how not to apologize," Lerner says. "I don't know what was in my head when I took that picture, but that doesn't matter. There's no excuse and I understand why you could feel violated by that photo. I remember that rehearsal differently, but what's important is the impact it had on you and you felt violated by my actions, and for that I apologize. I have tremendous respect for your work for the USO and I am ashamed that my actions ruined that experience for you. I am so sorry. Sincerely, Al Franken." Tweeden and the host responded positively. "Good letter," one said. "Yeah that's great," another chimed in. Saying "I'm sorry" sounds good, but psychologist Harriet Lerner says it's actually not necessary. (Though comedian Louis C.K. caught plenty of flak for not using those words in his apology to the female comedians he harassed.) Lerner says, "It's not the words 'I'm sorry' that heal or soothe the harmed party. What the harmed party wants and needs to hear is an emotionally packed corroboration of the reality that occurred: 'Yes, I get it. It was terrible. It was unconscionable. Your feelings make sense.' "
Good apologies are important, Lerner says, but they're not enough. Apologies do not excuse perpetrators from the consequences of their actions. And they do not compensate for a culture where women have less power and less privilege — and too many men have things to be sorry for.